Provide comfort for the family of Johnathon Rains with a meaningful gesture of sympathy. John Rains, 25, of Independence, MO passed away suddenly on Monday, April 1, 2019. A visitation will be held from 4-7pm on Sunday, April 7, 2019 at Speaks Suburban Chapel 18020 E. 39th St, Independence, MO, 64055. A service will be held on Monday, April 8th at 10am at the chapel. 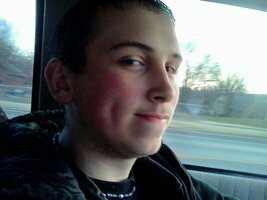 John was born on February 18, 1994 in Blue Springs, MO to Michael and Tonya (Wiley) Rains. He attended Truman High School then went on to work for the family company, Action Alarm Inc., in Independence. He liked anything on wheels and couldn’t help himself from upgrading his cars. From stereos, to painting them, and changing the exhaust – if it had wheels or a motor, he had to get his hands on it. He enjoyed the outdoors, fishing, and shooting guns. John loved his family. He had hoped to one day take over the family business. Most of all he loved his daughter and his niece. He will always be remembered by his daughter Lillian Lee Rains of Independence, MO; his parents Mike and Tonya Rains of Independence, MO; sister Jessica Kelly and husband Kevin of Independence, MO; niece Sophie Diane Due of Independence, MO; grandparents Danny Rains and wife Sharon of Independence, MO, Candace Smith and husband Paul of Green Valley, Arizona, and William Smith of Independence, MO; best friend Tyler Richardson; Kortni Milton, and Angel Williams; his dog Jack; plus several other extended family members and many, many friends. He was preceded in death by his maternal grandparents. To send flowers in memory of Johnathon Eugene Rains, please visit our Heartfelt Sympathies Store. Consider providing a gift of comfort for the family of Johnathon Rains by sending flowers. We encourage you to share your most beloved memories of Johnathon here, so that the family and other loved ones can always see it. You can upload cherished photographs, or share your favorite stories, and can even comment on those shared by others. Provide comfort for the family of Johnathon Eugene Rains by sending flowers. Dan & Sharon I wanted to express our sympathy to you and the family. We will be praying for you. Take Care. Sending you our love and prayers. We are so sorry about what happened. He was a good kid[should say young man]. He always had smile and willing to help in anyway he could and will be missed. If I could take the pain for you guys I would. May he rest in peace.